This review explains why you should be very careful when dealing with projects like The Coin Circle of Tyle Price. Price claims that he is a cryptocurrency professional that can advise you which tokens to buy to make huge profits. He reveals his tips within his Coin Circle that costs $39. Can you trust Price and his Coin Circle? We are in cryptos since 2015, so we have clear picture of what is happening. Until April of last year the scene was pretty quiet, then almost every cryptocurrency started to rise and this lasted until the end of the year. So, last year a lot of crypto gurus were born, because no matter what you bought, you made money. Then came January of this year and all cryptos started to decline. A lot of those gurus disappeared, a lot of scams collapsed. Now we see a new wave of hindsight gurus that are claiming that in the past they knew what to buy, but they are not telling you that since January everything is going down. Price obviously is one of these fake gurus. He says that every month there are dozens of opportunities to make huge returns on cryptos. It is a lie. In January, February and March everything was going down. No matter what you would have bought, you would now be sitting on a loss. Maybe there are a few exceptions, but these would be cryptos that were pumped and dumped via illegal schemes. So, this is the first lie of Price. 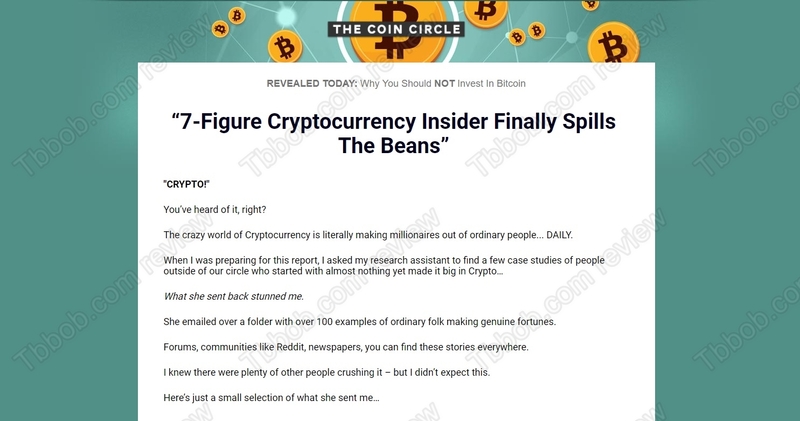 Another lie is that The Coin Circle is “one of the most respected reports in the industry”. In fact, we have never heard of it and we are watching the space very closely for years. The Coin Circle is just a new BS product of a fake guru. We do believe that cryptocurrencies are the future and we do believe they will rise again, but nobody knows it for sure and nobody is able to pick up the big winners like Price is claiming. The Coin Circle is hindsight guru fake product, we recommend staying away from it. If you want to trade cryptocurrencies, do your own research, understand how it works a try trading risk free on free demo first.